I know. That title may sound scary to some of you. Tofu is mushy, slimy, and gross. Or is it? Meat and I are still on the rocks so I wanted to attempt a new tofu recipe. The first time I tried to cook it it turned out too soggy, the second time was pretty good, and this third time was freakin’ spectacular thanks to Emily over at the Daily Garnish. To start out I took a block of extra firm tofu, covered it in paper towels, and then stacked a couple of books on top to press out the water. The longer you let it sit, the less mushy it’ll be. I started mine at about noon and cooked the dish at 5. You can’t see the tofu in this photo but it’s under the cookie sheet! To prevent a soaked countertop, I placed the tofu on top of my cutting board that has a little moat around the edge so that it’d collect any excess water. Next, I lost my mind for a bit and couldn’t understand how to cut the tofu block properly per Emily’s instructions. This is why I have multiple slabs instead of a couple thin ‘steaks’. Course I got the concept after I did my cutting. Classic. Then I marinated the pieces in a little bit of soy sauce. There are lots of spices to this dish but it’s a snap to put together! Did I mention that Al, my husband, doesn’t enjoy change and/or funky textures in food? I’ve only forced him to eat tofu one other time (the second ‘pretty good’ time I made it) and he didn’t like it. Even with the cards stacked against me I still had hope. I thought, there’s no way he can’t like this! It’s too good! as I shoved another crispy piece in my mouth when I was done. Whenever I have to make a rub or a coating for a recipe I always end up with extra stuff that I have to throw away. 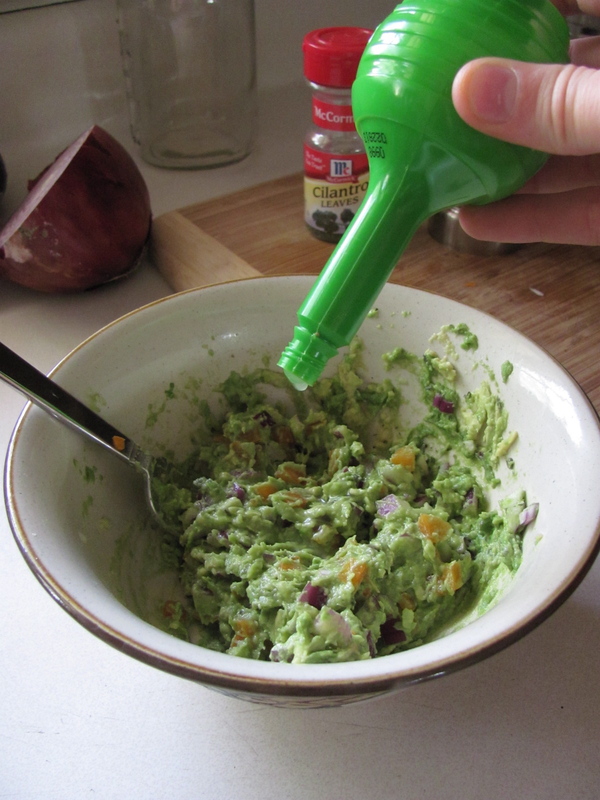 With this recipe, I had absolutely none! The perfect amount of spices for the tofu. A pleasant surprise. The spices create a great outing coating of what’d I’d call Spicy Asian BBQ. So tasty. You could totally use this as a rub on chicken or beef if you’d like. Or shrimp! That’d be super good. But that’s not really the point, the point is that it’s amazing on tofu, a meat alternative! Just look at that color. Start by pressing a block of tofu to drain out the excess water. 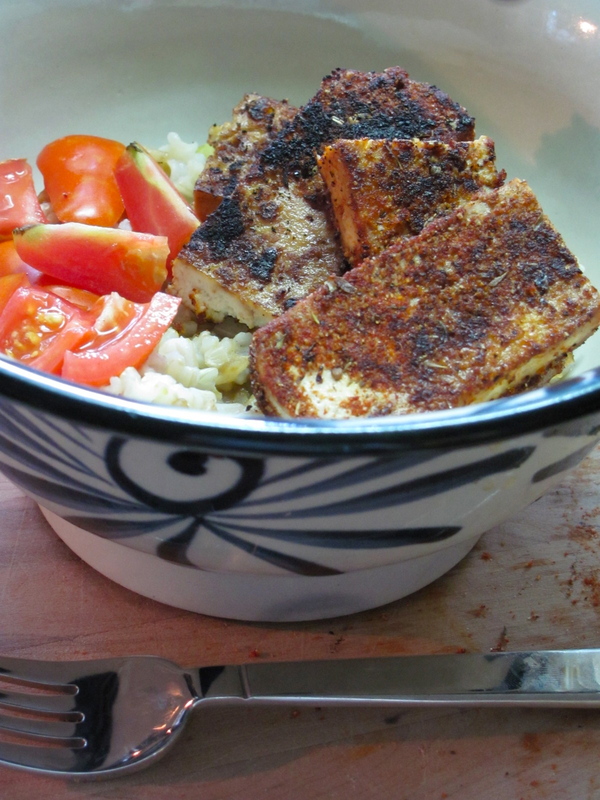 While the tofu drains, go ahead and make your spice mix. 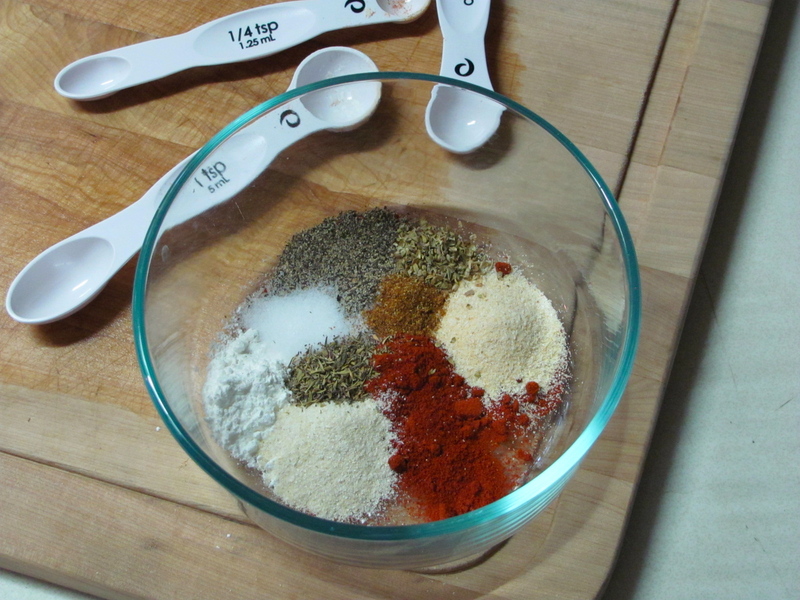 Add all spices to a shallow bowl, and stir to thoroughly combine. 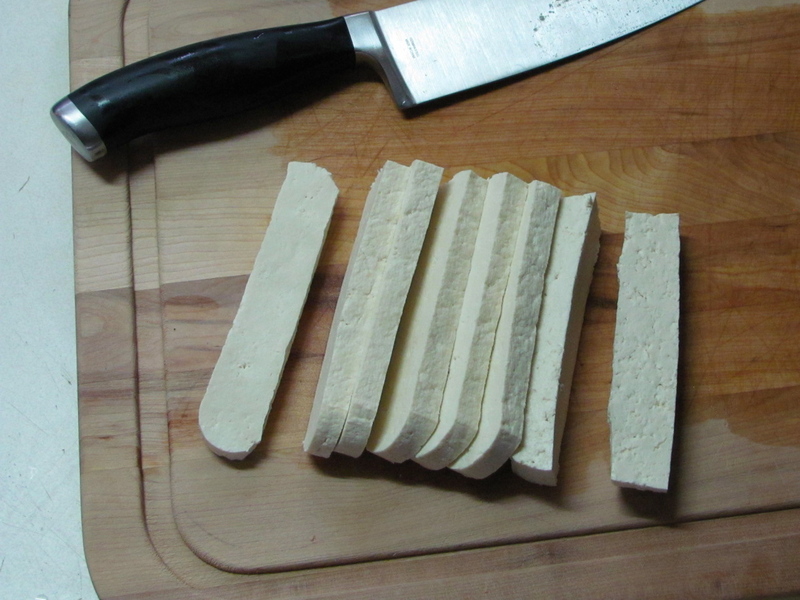 Once the tofu has drained, slice the block into four even rectangles – once through the width, and then cutting in half through the top (did that make sense?). Place tofu in a shallow dish and add soy sauce or liquid aminos – it doesn’t need to be much. Just enough to let it soak into the bottom a bit. After a few minutes, flip each piece to coat the other side. 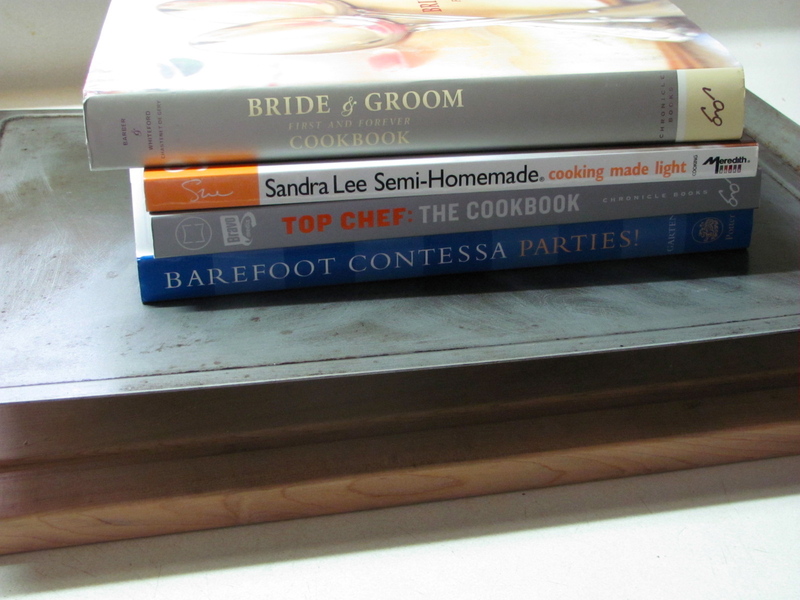 In a saute pan, heat sesame oil (or other oil of your choice) over medium high heat – you want your pan to really get hot! I prefer to use my non-stick pans for this, but you can try it in stainless as well. Take each piece of tofu and press it into the spice blend, ensuring to coat the whole bottom in a thick crust of spice. Flip it over and repeat on the other side. 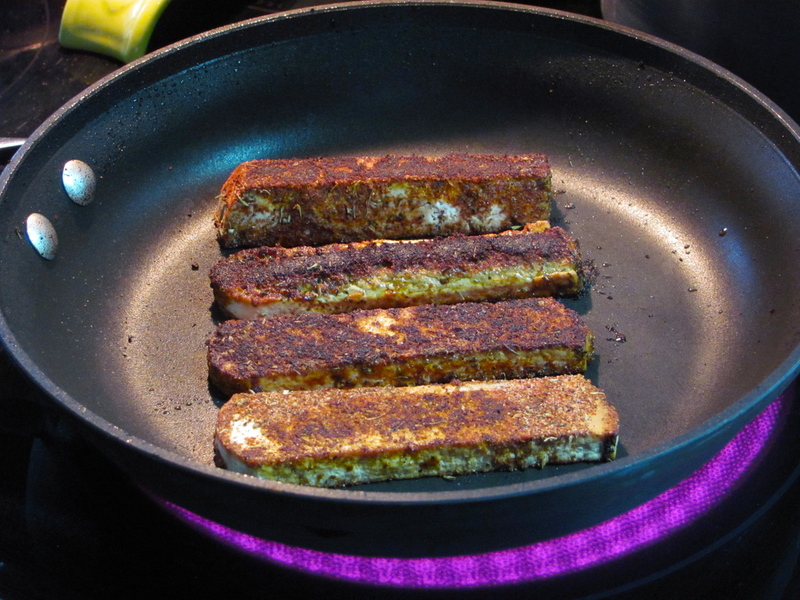 Then carefully place each piece into the hot pan – it should sizzle and pop, and you’ll see immediate color forming around the base of the tofu. Add all four pieces to the pan and continue to cook over medium high heat. After only a minute or two, the bottom should be pretty dark in color – flip to the other side! Cook for another minute or two on the other side, until both are crispy and blackened to perfection. Slice and serve on a bed of rice with a side of roasted greens! I served it over brown rice, split peas, tomatoes, and a little soy sauce. Super random but we needed to use up the tomatoes from the garden and I wanted more veggies so I added the peas. It worked out really well! Al even admitted that the dish was ‘pretty good’. He said that he wouldn’t eat the tofu alone (he’s crazy) but he’d eat it like I served it. I’ll take what I can get! Thank you Emily for your recipe! I’m so glad it was successful. I don’t care if you think you hate tofu. You’ve got to make this dish! Do you eat tofu? How to do prepare it? It is sad to say that I am the only avocado lover in the house. 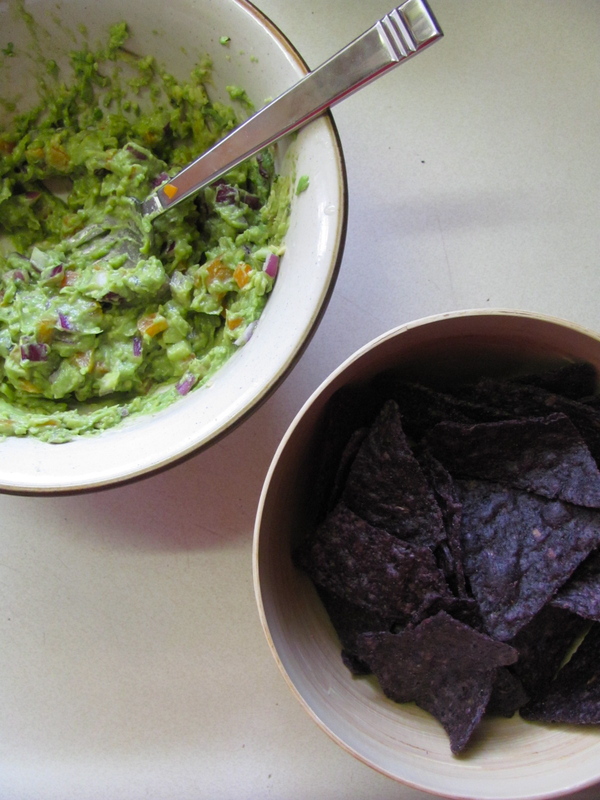 This means that the only time I get to devour one is at lunch, usually in the form of guacamole. Last week they were on super sale so I picked up two. 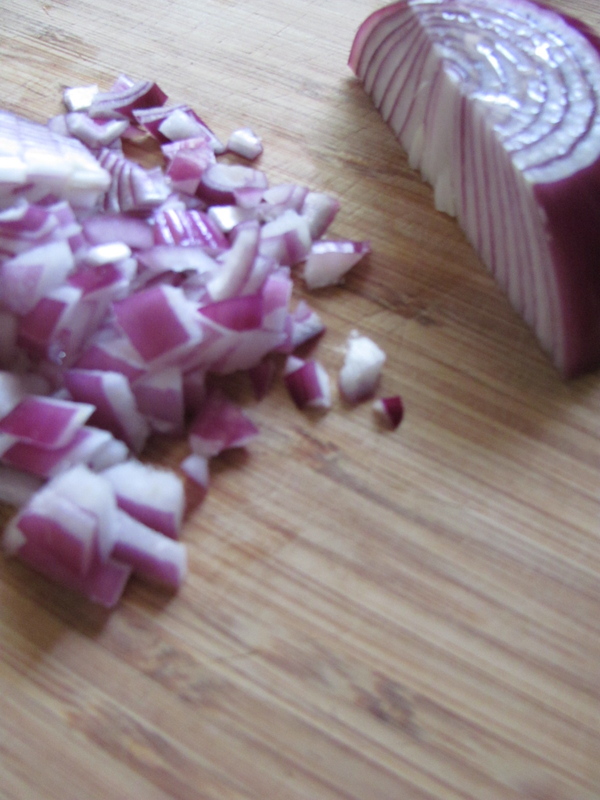 First I chopped up the onion into tiny pieces. Please make sure they are SMALL pieces! 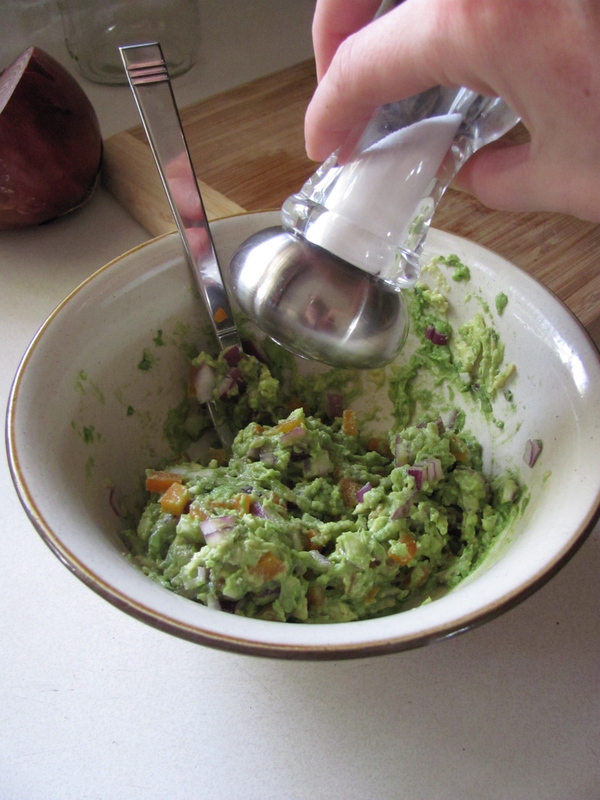 Often times I’m so excited to be eating guacamole that I chop up the onions into larger chunks only to painfully choke them down later when they’re burning my mouth. No good. 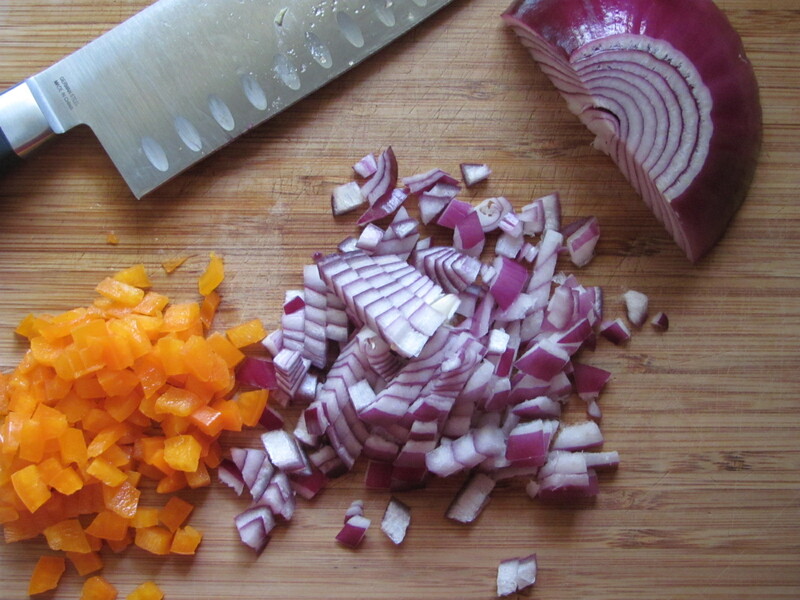 Then I chopped up the bell pepper. 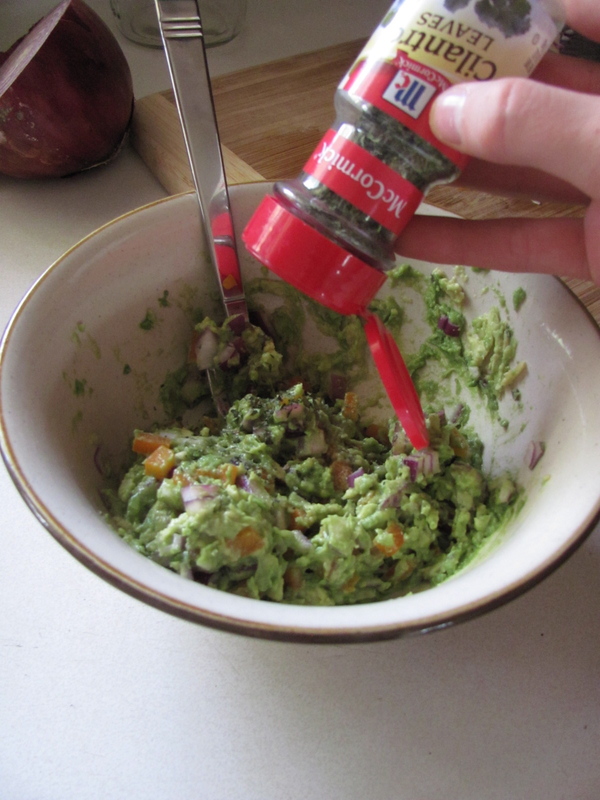 I could taste them in the guacamole but they didn’t overpower anything so I might start adding them regularly to my recipe. Usually when I make this, I eat the whole thing and lots of chips, so any added veggie is a nice bonus. 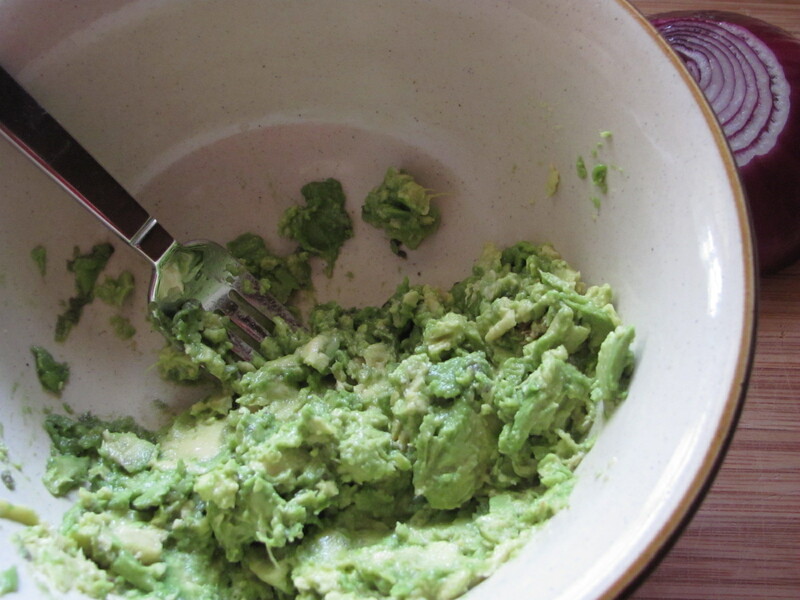 Next I mashed up the avocado. Mixed in the onion and bell pepper then shook in some salt. I added in the dried cilantro but if you’re fancy (unlike me), you could use fresh. Oo la la. Finally I squeezed in the ‘fresh’ lime juice and mixed it all together. Pour a giant bowl of chips and dig in! A tasty, healthy snack… or lunch. Do you have a favorite food that everyone else seems to hate yet you love it with all your heart? Mushrooms is another one for me!